You are here: Home › News › Mälarhamnar & E-Crane: Over 10 years of successful cooperation. 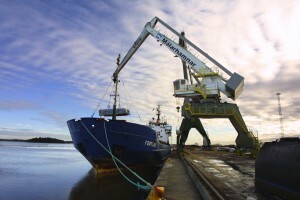 In 2003, the Port of Västerås, part of Mälarhamnar AB, renewed an important contract with a local Power Company, Mälarenergi, for the highly important unloading of fuels for power plant incineration. A rapid, steady increase in the power plant’s production capacity and more focus on supply chain reliability made it obvious that an increase in bulk unloading capacity was also needed – for both the short and long term. Further, as an additional challenge, the port was and is still bound by internal logistics that vessels have to be unloaded directly into 50 m3 dump trucks running a circle path to the power plant. 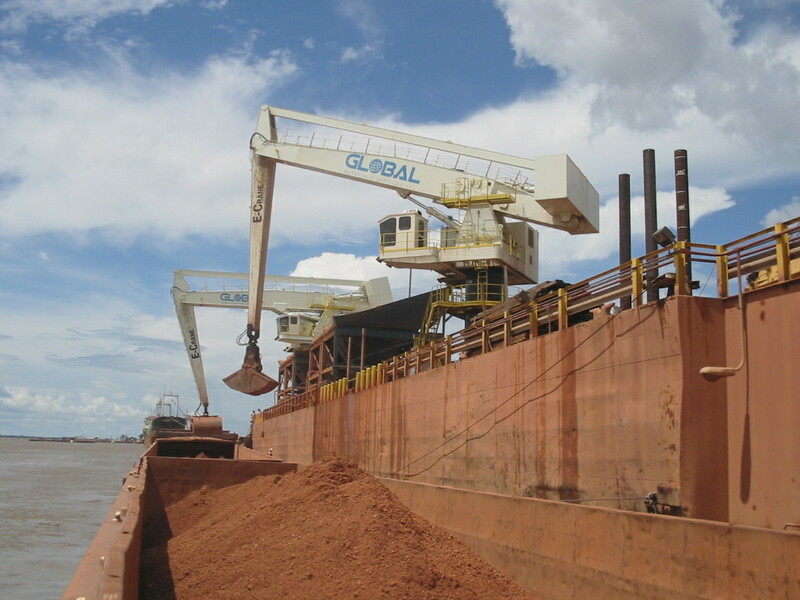 This meant the port was in need of a bulk crane which would allow for efficient unloading into trucks. The port, being a very capable crane user, was also very aware of the importance of a proper crane classification, as opposed to non-classified machines. They were also aware of the always important and highly prioritized ergonomics for the crane operators. Rather than to go for a common hydraulic material handler, the port focused on a machine with a higher level of reliability combined with an extended machine life. Only a handler classed as a crane, (A8 according to FEM), could meet these conditions. This is why E-Crane, together with the Scandinavian agent Port-Trade, was selected as the preferred supplier. An added challenge was that the new crane’s upper structure needed to be installed on an existing Kone rail portal. In close cooperation, both parties found a workable solution for this. Mälarhamnar took responsibility for the structural integrity and strength of the portal as well as the dismantling of the existing Kone crane, while E-Crane designed a new access to the crane upper structure as well as an emergency escape route (all approved by Inspecta).This led to a successful crane commissioning in the fall of 2003. The machine has been in operation ever since. An additional benefit of the E-Crane’s equilibrated system is the reduced power consumption. 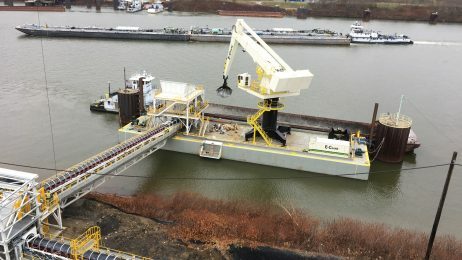 Compared to traditional material handlers and rope cranes, the E-Crane gives power savings of up to 50% in combination with reduced carbon emissions! The hydraulics on an E-Crane are always powered by an electric motor – this has been an E-Crane design philosophy since the late 90’s as this is by far the most ecological, the most energy efficient and the most cost effective power source. This way of powering the machine also adds a benefit to the E-Crane that any machine can be fed directly from a main power grid and by a genset (optional). At Mälarhamnar, all three machines will be fed directly from the main power grid. In 2011, Mälarhamnar was forced to react on several of their rope cranes being worn down, causing an overall lapse of capacity and reliability. Around the same time, the Swedish Government and Maritime Administration (Sjöfartsverket) marked the sea of Mälaren for a period of substantial investment and expansion in 2010. With over 150 million euros being put towards increasing access to the ports and its internal facilities, Mälarhamnar will be able to receive ships with double capacity, (in terms of tonnage), in the near future. This is a huge opportunity for both Västerås and Köping to become more operationally efficient. Once the locks into the sea of Mälaren are opened out to their full width and depth and the fairways into the ports have been deepened, the cost of transporting goods into the area could be reduced by up to 20%, making it an even more vital facility for those operating in the Swedish logistics chain. 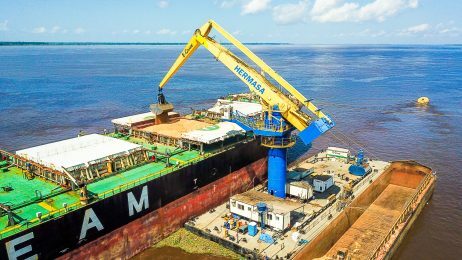 This also meant that the outreach for the new bulk crane had to be increased to over 30 meters (compared to 26 meters for the first machine) considering the future size of ships calling into Västerås. 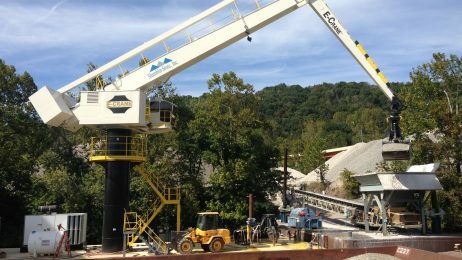 Again, E-Crane was selected as the preferred partner and the second unit was installed in the fall of 2012. At the end of 2013, a third E-Crane was ordered, this time for the sister port in Köping which is 30 km away. A new 1500B series E-Crane upper with 31,7 m outreach is scheduled to be delivered and commissioned by mid-2014, bringing the total number of E-Cranes owned by Mälarhamnar to 3! Mälarhamnar has the flexibility to handle a large number of different bulk materials. 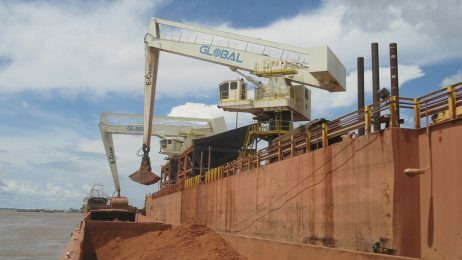 Tools for handling all kinds of dry bulk materials (including coal, peat, sand, …), wood packages, timber, big bags, etc. are available to serve clients with various demands. 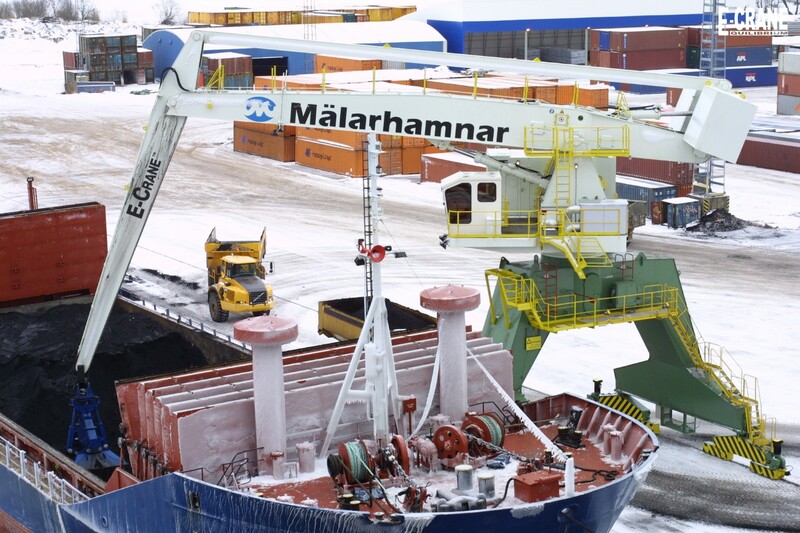 Combined with the ability of the E-Cranes to (un)load ships up to Handy size at the lowest cost per ton, this gives Mälarhamnar the competitive edge they need in today’s challenging market conditions. E-Crane & Port-Trade would like to thank Mälarhamnar’s management and personnel for over 10 years of successful collaboration. With its two ports strategically located in Köping and Västeras in the heart of the Mälardalen region, Malarhamnar AB provides opportunities for both efficient and environmentally friendly transportation all the way into the middle of Sweden’s industrial belt. Mälarhamnar AB is an obvious partner when you want to streamline your logistics. Their wide range of services as well as their flexibility also means opportunities to increase your customer’s competitiveness. Managing the two ports of Köping and Västerås strategically located by the Mälaren lake in the industrial hub of Sweden, Mälarhamnar AB offers a comprehensive portfolio of harbour services including goods handling, warehousing, container stuffing/stripping,customs management etc. The two port entities have both existed since 1000 AD as important individual centres of trade for the country until 2001 when they joined forces as a single company and continued to success fully meet the needs of the international shipping industry. Newsletter issue #25: Mälarhamnar & E-Crane: Over 10 years of successful cooperation!